The Sword's forward momentum hits the Earth running on Apocryphon, the follow up to the temporal exploration of their third album, Warp Riders. The guys that comprise Austin, Texas' warp riders', The Sword, have journeyed over criticism during their six year existence despite their notable success. Guitarist/vocalist J.D. Cronise (who founded the band and wrote all the music for their debut, Age of Winters), guitarist Kyle Shutt and bassist Bryan Richie have had to shield themselves from detractors who questioned their true motivations: accusations of being indie hipsters playing heavy riffs just for the sake of being ironic were bandied around, especially when the band played trendy festivals such as South By Southwest and allowed "Freya" to be included on an early installment of the video game series, "Guitar Hero". The band also faced scrutiny from hardened doom/sludge fans because of their first two records—Age of Winters and Gods of the Earth—both of which were tagged "retro" and deemed highly derivative of their influences: Sleep, High on Fire and their ilk, and therefore were classed not good enough. In direct contradiction to this, The Sword's popularity continued to rise: Gods of the Earth landed on the US Billboard 200 chart and a certain metal band by the name of Metallica took a shine to The Sword and brought them out on the road on their European Vacation Tour in 2008. But as far as the music on The Sword's first two albums is concerned, the only criticism that actually hit the mark was the fact that the band noticeably lacked a true voice of its own. But being criticised for not having found an original sound is a flaw distinct from the derogatory declarations of being derivative that were aimed at The Sword. It has never been disputed (even by the band) that they more than thumbed the pages of the doom/sludge rule book according to bands like Sleep, yet being disregarded by doom/sludge fans for leaning on the well established tenets of the genre was harsh considering every riff heard in this style of metal is of direct lineal descent to the ominous sounds Tony Iommi wrenched from the bowels of hell during the '70s—it has been a case of steal from the king to feed the pauper ever since the genesis of doom/sludge was carved into legend on Sabbath's mercurial debut. Yet in spite of the criticism (as well as the praise), the guys in The Sword continued to keep their heads down and refused to fan the flames of skepticism or feast upon their achievements. Instead The Sword took every drop of condemnation on board and used it constructively when creating their third full length, Warp Riders: a science fiction concept album launched into space in 2010. Warp Riders was the sound of the The Sword realising that in order to invert the opinions of the past they needed to alter their musical approach so that comparisons to bands at the heavier end of the sludge spectrum would no longer be applicable. To accomplish this transition they moved away from the molten sludge, Slayer riffs and huge grooves, and in their place pushed classic rock and melodic thrash metal to the fore while evidently focusing on reinforcing Cronise's vocal weaknesses—he always used a clean style but previous to Warp Riders he lacked personality and his melodies tended to drift aimlessly amongst the mighty riff formations. Warp Riders was a career turning point and The Sword's most successful release; the record where The Sword found that true voice. And because of this new found comfort in their own skin as well as the adventure of their fantastical album concept, even drummer problems (Trivett Wingo left the band after a number of years and was replaced by Kevin Fender to complete tours and then he gave way to current drummer, Santiago "Jimmy" Vela III) could not stop The Sword's onward momentum. This momentum has continued through to 2012 and has hit terra firma on The Sword's fourth full length in six years--Apocryphon (their first for New York label, Razor & Tie). 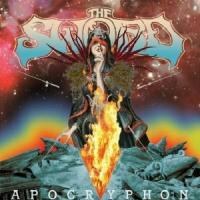 As expected Apocryphon does not venture far from the musical style of Warp Riders and this is the album's biggest strength: having musical stability has allowed The Sword to hone song-writing and further tighten both vocal and instrumental hooks. Apocryphon has been produced by former Jawbox guitarist/vocalist J. Robbins, and his admirable job of balancing the clarity and power of The Swords twin guitar attack can be heard from the first scorching riff of "Veil of Isis"—reminiscent of Red Album-era Baroness. "Veil of Isis" is an epic condensed into five and a half minutes and the earthy intensity of its riffs, its tempo variations, "foot on monitor"-style soloing and insistent vocal melodies as a whole are indicative of the individual ideas explored throughout Apocryphon. "Cloak of Feathers" tightly grips the coattails of Warp Riders hitting the classic rock moves of ZZ Top and Thin Lizzy, with melodies that link the song to "Maiden, Mother & Crone" off Gods of the Earth and nimble bass-lines courtesy of Richie who shines through the pillars of riffs. The next three tracks: "Arcane Montane", "The Hidden Masters" and "Dying Earth"—all in typical The Sword fashion—lean lyrically on fantasy, but there is some apocalyptic tension in Cronise's words. On "Arcane Montane" Cronise begs for assistance from the mountains while they band shake the ground with some Clutch-style swagger. During the doom of "The Hidden Masters" he pleads and questions: "Look at yourselves / Look at your world/ What have you done? / What shall you become? ", while on the devastating riff haven of "Dying Earth" he resigns himself to the fact that we are all doomed: "As the sun fades from the sky / This ancient earth prepares to die / Here at the end of all time / A slow demise so saturnine." These three tracks all mention Gods, Sorcerers and Masters but behind the imagery it is clearly fantasy steeped in reality. As mentioned previously the vocal hooks and song-writing on Apocryphon is better than ever, shining the brightest during "Seven Sisters" and "Hawks & Serpents". The former taking the Ozzy approach of letting the vocal melody follow the memorable riff pattern; such is the catchiness of the riffs that Cronise and Shutt twist together—they are an underrated riff writing team. While the latter, "Hawks & Serpents", channels the '80s in sound and spirit; further confirming that you can't stop rock 'n' roll! Apocryphon ends with the title track and takes off through the cosmos with a more thrash centred blast, coming full circle from the journey that Warp Riders embarked on two years ago. This complete cycle is even acknowledged by the band, Cronise declaring in the final lines of his lyrics: "Everything comes around again / The serpent eats its tail". Whether this album signals the end of this particular musical journey is uncertain but one thing is for definite: The Sword is currently one of the best rock bands operating in this galaxy today. Not bad for a bunch of indie hipsters playing heavy riffs just for the sake of being ironic!